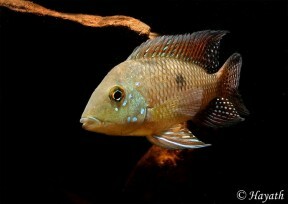 Adult male from the aquarium trade. 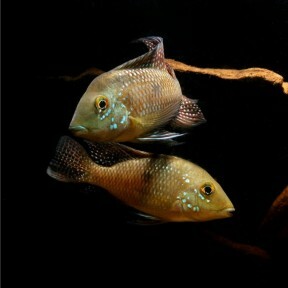 Adult pair from the aquarium trade, male upper. 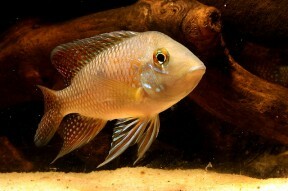 Subadult male from the aquarium trade. 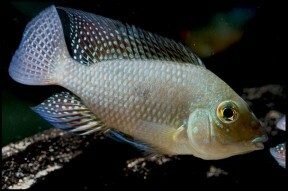 iporangensis: named for the municipality of Iporanga, São Paulo state, Brazil, where this species was discovered. Known only from the rio Ribeira de Iguapé drainage basin which lies within the Vale do Ribeira, a coastal valley formed by the river straddling the border region between the states of São Paulo and Paraná, southern Brazil. Type locality is given as ‘Mountain streams of Rio Ribeira de Iguapé, Iporanga, Brazil’. Likely to range throughout a significant proportion of the Ribera de Iguapé system, much of which is heavily-forested. Male 90 – 100 mm, female 60 – 85 mm. Minimum base dimensions of 120 ∗ 30 cm or equivalent are recommended. Likely a generalised omnivore in nature. Stomach content analyses of the relative ‘G.‘ brasiliensis revealed it to feed on a variety of plant material, aquatic invertebrates (particularly chironomid larvae, ostracods and cladocerans), fish scales and fry. Although often referred to as an ‘eartheater’ this species isn’t as benthophagous as members of Geophagus though mouthfuls of substrate are sometimes taken and sifted for edible items. In the aquarium offer good quality, sinking dry foods as staple alongside regular meals of live or frozen bloodworm, Artemia, etc. 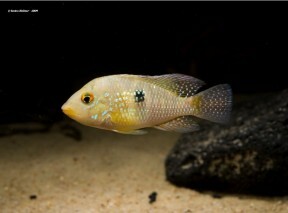 Males are territorial, particularly when spawning, while very small tankmates may be predated upon. Males grow larger than females, often significantly so, and most dominant specimens develop a nuchal hump to some extent. Not a common species in the aquarium hobby which is a shame since its adult size is more manageable than that of some related species. Juvenile specimens of this species are readily confused with those of other members of the ‘G.‘ brasiliensis species group, but adults are easily-distinguished by their relatively smaller adult size and comparative lack of reflective blue scales on the body and head. The other main conclusions of the paper are confirmation that Geophaginae is a monophyletic group exhibiting strong signs of having undergone rapid adaptive radiation. The cytochrome b gene as a phylogenetic marker: the limits of resolution for analyzing relationships among cichlid fishes. An annotated catalog of the cichlid fishes collected by the expedition of the Carnegie Museum to central South America, 1907-10.